"I welcome you to try. You're not the only one who can ride the wind!" Whether they are seen as traveling nomads or esteemed members of the army, Dragoons are easily recognizable by their dragon-like armor, crafted to show their resemblance to their dragon counterparts. Often seeking to reach new heights, many Dragoons have gone on a training ordeal at some point in their life, jumping to the highest of mountains, sometimes even befriending a wyvern along the way. Throughout history, many Dragoons have taken the surname of Highwind upon themselves, to show their respect to the man who first befriended the wyverns. Or so the legends say. Dragoons are special knights that are best known for their trademark spears. Using their long reach, a skilled Dragoon can carefully thrust through enemy lines, effectively taking out enemy magic users through selected targeting or MP draining techniques. One of their most commonly used abilities is Jump, which allows the Dragoon to do an aerial attack for moderate damage while still gaining a defensive advantage from being off of the field. With a bit of planning and a touch of intuition, the Dragoon can avoid the brunt of dangerous attacks. At times however, the Dragoon is left in a position where jumping would leave their weaker allies open to attack. Using their breath attacks, the Dragoon can hold back waves of enemies while their allies fight safely from the back row. Boost Jump is performed as two actions. When the Dragoon first uses Boost Jump (80D F55), they leap off the battlefield and cannot be targeted by any action. They remain in the air until their next action, upon which the Dragoon immediately lands (40D F15), weapon-first, on the target, dealing normal weapon damage. If they Dragoon is equipped with a spear, the damage receives a power multiplier of x1.5 instead. Boost Jump is Ranged, no matter which weapon is used to perform it. In the Remodeling and Bare systems, rather than needing to equip "Spears" for the damage boost, they need only have a Heavy strength. The Dragoon ignites the ground with a spray of blazing fire. Fire Breath inflicts (10 x MAG + 1d10) magical Fire damage to a row - the enemy front row, if the Dragoon is in the back row, and the enemy back row, if the Dragoon is instead in the front row. If only one row remains, Fire Breath targets that row. Adjustment: +30 MP, +5 Power and per tier above 1. The Dragoon exhales a gout of icy fog, which fans out along the ground before exploding into jagged shards. 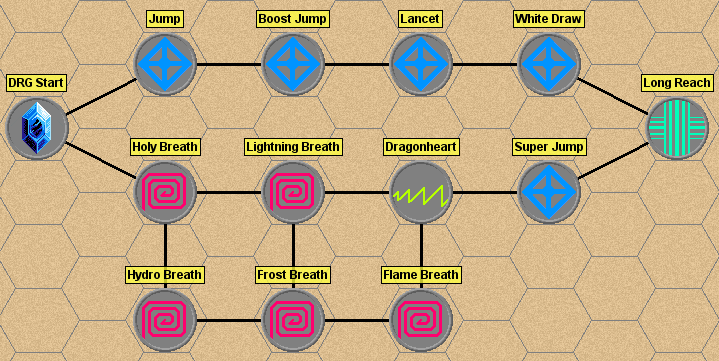 Ice Breath inflicts (10 x MAG + 1d10) magical Ice damage to a row - the enemy front row, if the Dragoon is in the back row, and the enemy back row, if the Dragoon is instead in the front row. If only one row remains, Ice Breath targets that row. Adjustment: +30 MP, +5 Power per tier above 1. The Dragoon fires a blazing ray of energy from his jaw, carving a sweeping path along the ground. Moments later, the earth bursts forth with sacred energy - Holy Breath inflicts (10 x MAG + 1d10) magical Holy damage to a row - the enemy front row, if the Dragoon is in the back row, and the enemy back row, if the Dragoon is instead in the front row. If only one row remains, Holy Breath targets that row. The Dragoon exhales a stream of water at his opponents. Hydro Breath inflicts (10 x MAG + 1d10) magical Water damage to a row - the enemy front row, if the Dragoon is in the back row, and the enemy back row, if the Dragoon is instead in the front row. If only one row remains, Hydro Breath targets that row. Jump is performed as two actions. When the Dragoon first uses Jump (60D F40), they leap off the battlefield and cannot be targeted by any action. They remain in the air until their next action, upon which the Dragoon immediately lands (60D F20), weapon-first, on the target, dealing weapon damage with a x1.5 Power multiplier. If the Dragoon is equipped with a spear, the power multiplier is x2 instead. Jump is Ranged, no matter which weapon is used to perform it. In the Remodeling and Bare systems, rather than needing to equip "Spears" for the damage boost, they need only have a Heavy strength. The Dragoon's weapon glows red for a moment, then strikes into an enemy with intent to siphon its energy. Lancet deals weapon damage with a x0.66 Power multiplier to both the targets HP and weapon damage with a x0.33 power multiplier to the targets MP. Any damage dealt is then drained to the Dragoon, restoring his HP and MP by the indicated amounts. the enemy front row, if the Dragoon is in the back row, and the enemy back row, if the Dragoon is instead in the front row. If only one row remains, Lightning Breath targets that row. Super Jump may also be used without taking an ally along - in this case, the Dragoon simply leaps into the air for a while. It cannot be used upon an enemy target. The Dragoons weapon glows white for a moment before they strike at a foe, pulling mana out of it and sending it spiraling through his parties formation. White Draw inflicts normal weapon damage, but to the target's MP. Any damage dealt is divided by the number of member of the party, and all members have that much MP restored. The Dragoon is capable of using any weapon from the Back row with no penalty, and suffers no penalty to hitting targets in the back row with any weapon as well. Trigger: The Dragoon receives damage from an action. Dragoons are tenacious and hard to fell - Dragonheart grants Reraise (U). Once Dragonheart successfully activates, it will no longer trigger in that battle.